The PTC thermistor's resistance increases when the power seat switch is held down even after the power seat has been moved to the maximum in one direction. If the resistance increases beyond a specified level, current is cut to prevent a short circuit. 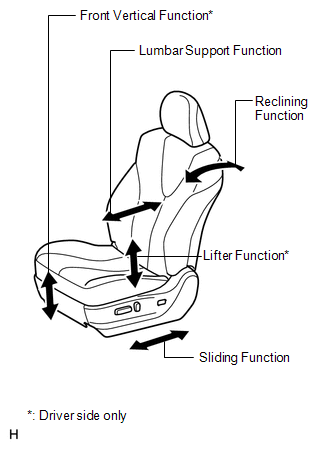 Perform the 4 steps below for the full range of motion for each power seat function. (1) Choose a power seat function. Operate the power seat switch and move the seat as much as possible in one direction. Keep the seat in that position for approximately 60 seconds. (2) Operate the power seat switch again and continue to try to move the seat in the same direction as in the previous step. Measure the amount of time elapsed before current is automatically cut (the sound of the motor has stopped). (3) After current has been cut, release the power seat switch and wait for approximately 60 seconds. (4) Operate the same power seat switch and move the seat in the opposite direction. Check that the motor operates. (a) Inspect the PTC operation inside the power seat motor. (1) Move the lumbar support to either the foremost or rearmost position by operation the lumbar support switch, and keep it there for approximately 60 seconds. (2) Try to move the lumbar support beyond the maximum position using the switch. Measure the time needed for shutting off the electrical current after the lumbar support stops moving (motor operation sound will stop, inspection of current shut-off). (3) Release the lumbar support switch and wait for approximately 60 seconds. (4) Operate the lumbar support switch to move the lumbar support to the opposite position and check that the motor operates.